Three generationsof Paul Ecke, father, son, and grandson. Christmas wouldn’t be as colorful without the Ecke family. 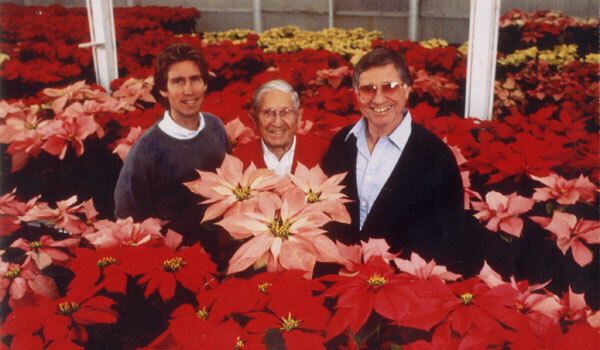 The family and the Encinitas-based company it created, which became the world’s largest poinsettia hybridizer, has a long history of promoting the vibrant plant. Paul Ecke originally marketed the plant because of its rare winter blooms. “Poinsettias are one of the few plants to naturally flower during the shortest days of the year,” wrote Andy Higgins, president of Ecke Ranch, in an e-mail. 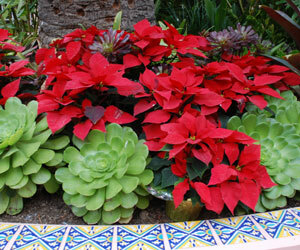 “Paul Sr. began using the flowers as cut flowers for Christmas, then went greenhouse to greenhouse nationally to promote the plant as the holiday option.” But his son, Paul Ecke Jr. planted the seeds of the typically crimson plant as the background to the idealized holiday celebration. 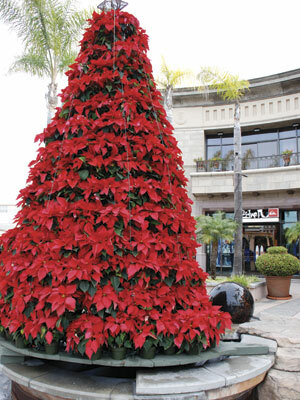 Poinsettias are often featured during the holidays as shown in La Jolla's La Valencia Hotel. Product placement on television and magazines in the ’60s and ’70s turned a native shrub of Mexico and Central America, which was prized for dye-making by the Aztecs, into the centerpiece of many a Christian holiday. The ranch is still in the Ecke family. Paul Ecke III is the owner and it produces tens of millions of cuttings each year for North America alone, according to Higgins. Cuttings are starter plants that are then flown around the country, and the world, to be brought to full maturity. The biggest cutting sales come in the months of July and August. But just because most of the plants are cuttings doesn’t mean that November and December are slow months. “During our peak shipping season for cuttings, we completely fill a cargo jet each day with poinsettia cuttings — just for the U.S. market alone,” Higgins wrote. Poinsettias are the No. 1 potted plant sold for a specific holiday, he said. The ranch protects its dominant position as a poinsettia grower by investing heavily in research, which it still does in Encinitas, despite shifting much of the growing to Guatemala. Dr. Ruth Kobayashi, head breeder at Ecke Ranch, doesn’t find the research process frustrating, although it takes four to seven years to breed and develop a new variety from scratch. So much about the plant is being improved, from the duration that the blooms last to the development of the color and shape of the blooms. “We are looking for the gems,” she said of her work with a staff of five researchers at the Ranch. “Most of our work now is focused on Christmas of 2011 and 2012,” Higgins wrote. And “the biology is no simple matter,” Higgins said in a telephone interview. Higgins, who began his career as a horticulturist more than 20 years ago, says breeding poinsettias is tricky. 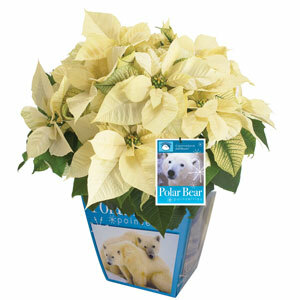 Sales of this white poinsetta, the Polar Bear Poinsettia, supports protection of the polar bear, a threatened species. “Maybe 10 out of 10,000 crosses will result in a usable plant,” Higgins said. Yet the company managed to create more than 65 different varieties. 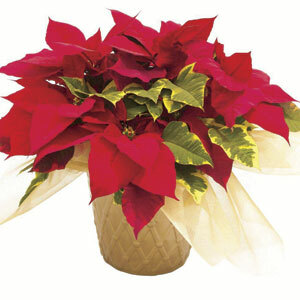 The poinsettia, which originally grew wild in Mexico and Central America, was a gangly hedge, almost a weed. With the help of science, determination, and chance, the poinsettia has been transformed to the elegant plant it is today. Despite all of the varieties available, red is still nearly 80 percent of the poinsettia market. However, the company currently has a promotion with Polar Bears International, where about 5 percent of net revenue of a white poinsettia is donated to protecting the animals each year. Poinsettias also are finding growth in Asia. “While they are not typically Christian and don’t celebrate Christmas, red is an important color to many Asian cultures,” Higgins wrote. Amazingly, 70 percent of U.S. flowering poinsettia plants start at Paul Ecke Ranch. And the ranch accounts for 50 percent of the world’s crop, making the Ecke Ranch a global economic powerhouse of poinsettia plants.